Saudi ambassador to Turkey was summoned Thursday at the Turkish Foreign Ministry to provide information on the whereabouts of Jamal Khashoggi, a Saudi dissident journalist who disappeared Tuesday after entering the Saudi consulate in Istanbul for some paperwork. Ambassador Waleed A. M. Elkhereiji met with Deputy Foreign Minister Yavuz Selim Kıran who asked him about the whereabouts of Khashoggi, according to Turkish media. The Saudi journalist and commentator has not been seen again since Tuesday after his Turkish fiancée and friends told police that he has not emerged from the Saudi consulate in Istanbul where he was to get official papers for his divorce that will allow him to get re-married. Khashoggi has fled the kingdom since September last year for fear for his life after was banned from twittering because of his critics of the policies of King Salman and his son Crown Prince Mohamed bin Salman. Saudi authorities Wednesday admitted that he entered the diplomatic compound but insisted that he left the mission. The Turkish presidency spokesperson Ibrahim Kalın however reportedly told reporters that the commentator is still inside the consulate. Kalin also indicated that Turkish authorities have been in talks with Saudi authorities to locate Khashoggi. 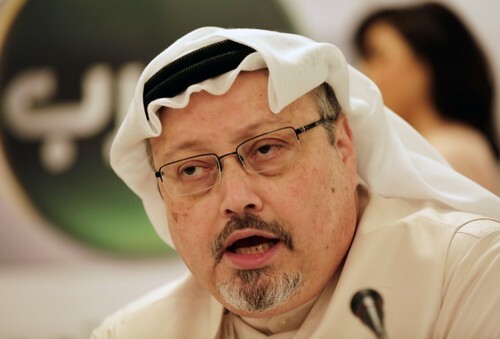 Khashoggi has been living in exile in the US and has written several articles for The Washington Post. His disappearance further exacerbates the strained ties between Turkey and Saudi Arabia. Riyadh has been irked by Turkey’s support to Qatar in the ongoing sea/air and ground blockade imposed by the kingdom, United Arab Emirates, Bahrain and Egypt since June last year over allegations the tiny Gulf country sponsors terrorism. Written by: KanelkaTagba on October 5, 2018. Posted by KanelkaTagba on Oct 5 2018. Filed under Gulf News, Headlines. You can follow any responses to this entry through the RSS 2.0. Both comments and pings are currently closed.